A hapless guy is thrust into the realm of superheroism when his girlfriend is kidnapped. Will the fun ever stop? This year has been swelling with great games, at least one for every system, almost every month. For October the GameCube gets Viewtiful Joe, part of Capcom’s mini-assault on GameCube first shown around this time last year. Joe is what you might call a well rounded anti-hero: he’s young, a little scroungy, has an air of snarkiness and is oblivious to his girlfriend Silvia’s advances, but has a big heart. He also keeps his priorities straight, so when the local theater begins running a classic film starring Joe’s hero Captain Blue, he drags Silvia along to the screening. Just when the movie starts to get good, the huge villainous robot reaches out of the screen and grabs Silvia. Captain Blue then grabs Joe and throws him into the movie world. It’s not long before Joe is granted the powers of a hero and is able to transform into a svelte crimson warrior, complete with pink scarf. From here begins Joe’s quest to beat up the faceless bad guys, rescue Silvia and figure out just what to call himself. The game continues to play out like the cheesy TV shows it mimics, with bemusing plot development (to say the least) and even "episode previews" after beating a boss. 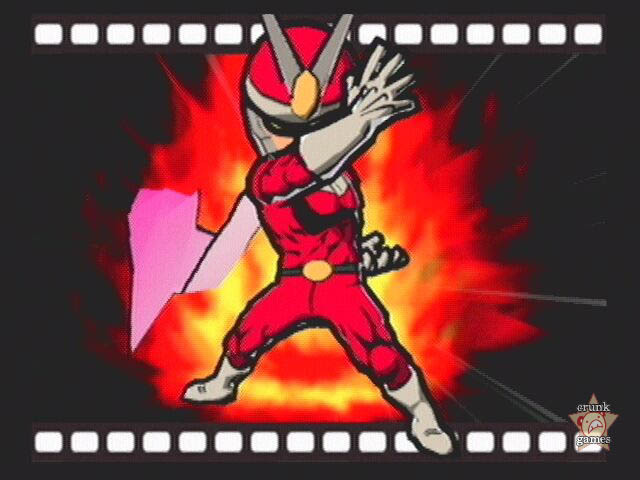 Like other cel-shaded games, Viewtiful Joe looks 2D. But unlike some other cel-shaded games, it also plays 2D as well; we reccomend using a Hori Digital Controller for maximum enjoyment. Every level (or "episode") is a gauntlet of "pieces" of the level, which you’re graded on each time after completion, from D all the way up to V for Viewtiful (C stands for "Crappy", by the way). Small puzzles are all over, and will always have a unique solution, encouraging you to use your skills creatively. The combination of smooth gameplay and the bean-shaped X and Y buttons of the Cube work well here, as you can let loose with endless strings of punch and kick combos. And in what could be a nod to River City Ransom, you can buy new moves and restorative items every once in a while. There is some heavy repetition of the same few enemy types (even if they’re in different costumes), but the beauty is less in the enemies as it is in the stages, the goofy characters and the stylish action. Joe’s not all about punches and kicks, though. 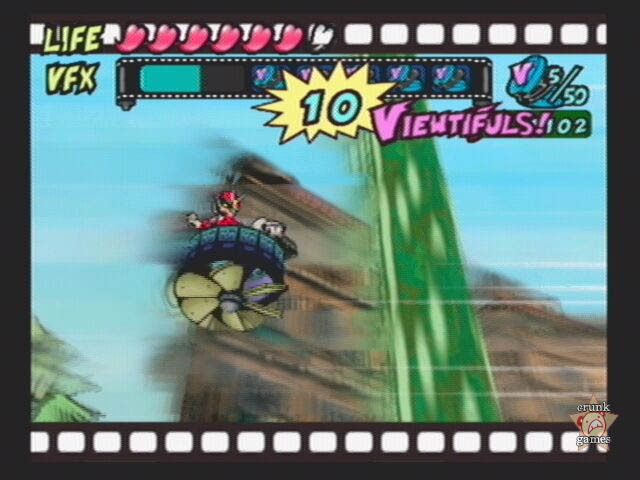 Before long you’ll learn the film-esque VFX (Viewtiful Effects) powers that can up the ante and enhance your fighting. 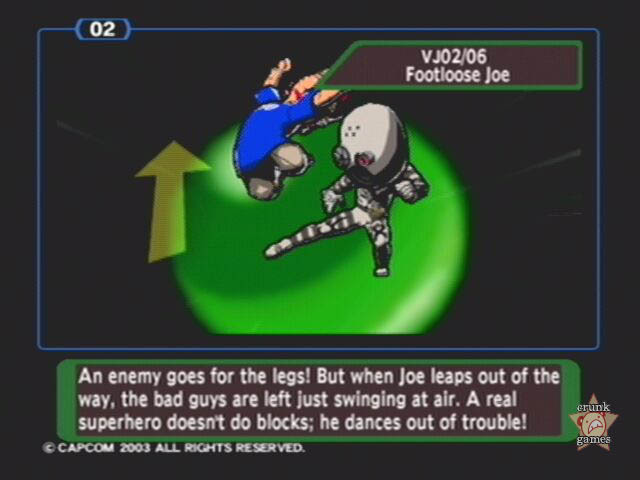 First there’s Slow, which of course slows the action to a crawl and lets Joe artfully dodge attacks and projectiles. Next is Mach Speed, which puts the game in fast forward. It isn’t entirely helpful on offense, but can set Joe on fire, which is always cool! Last is Zoom In, which is little more than enable you to perform spread attacks. Unfortunately, Joe has a VFX meter that depletes when he uses his powers, and once it’s empty he turns back into normal Joe and the screen becomes clouded in a film grain that can be a nuisance, so keeping mindful is key. Since the action can really pile up in the game (figuratively and literally), using VFX helps a great deal and most importantly, makes you look like you know what you’re doing. 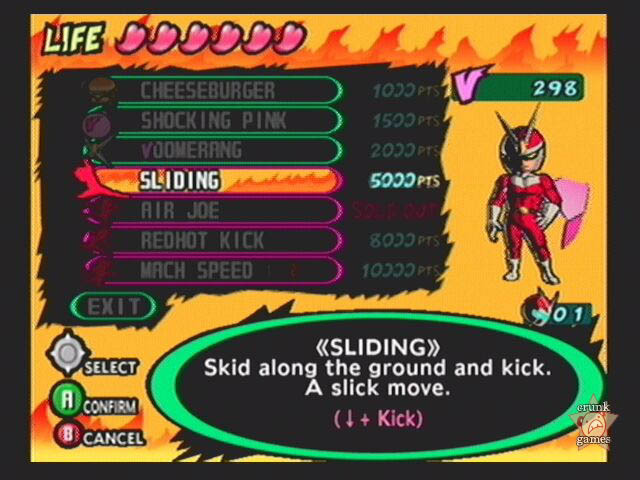 As a 2D-style platformer, Viewtiful Joe is unsurprisingly hard. Two initial settings, Kids and Adult, are available at the start, with another, even harder pair to unlock. And even though the game has "view" in the title, the default camera is a little too far in and can cause problems at especially hectic times. But unlike F-Zero (the last hard GC game), your progress is not as dependent on luck, just practice. The only other thing more annoying than the difficulty is that you can’t skip cutscenes even after continuing, so if you’re really bad, prepare to get awfully familiar with the story. But if you’re good enough, you’ll be sweetly rewarded with new playable characters and unlimited VFX.